All great marketing starts with deep understanding of your potential clients. What they need and want. What's important to them, their goals and aspirations. Their day to day problems, their fears. And ultimately, understanding what they need to know and feel to be ready to hire you. Of course, building that deep understanding isn't always easy. Most of us have a mass of data about our clients – but not necessarily much insight. In this short video I show you a simple process for taking what you know about your clients and translating it into Actionable Insights that you can use to make your marketing much more effective. I call it Customer Insight Mapping. My experience using the process is that you discover new insights about your client every time. And often you'll come across something really surprising that'll drastically alter the way you approach your marketing to that type of client. Check out the video – it's about 9 minutes long and it'll walk you step by step through the process and give you an example of how it works in practice. 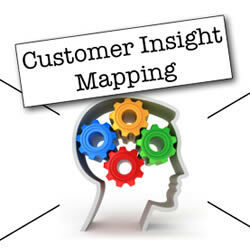 Give the Customer Insight Mapping process a spin – it'll take you about 10-15 minutes to do your first map – and it may well open your eyes to a completely different way of marketing and communicating to your ideal clients.